MIAMI - The edict came down during Roy Oswalt's first season in Double A. Thou shalt throw changeups, the Astros brass said, and thou shalt throw them at least 20 percent of the time. Needless to say, young Oswalt was not pleased. He was in the middle of a spectacular season - he'd finish at 15-7 with a 2.21 ERA - and was hellbent on reaching the majors via the shortest possible route. That route did not include shelving a dominant fastball and curveball in favor of a pitch he'd never thrown with any sort of success. But the brass had spoken, and that was that. Undeterred, Oswalt took matters into his own hands. He opened up his next start with a changeup, which he followed with another changeup, and then another. Then 10 pitches into the outing, a puzzled Mike Maddux - then the pitching coach for the Round Rock (Texas) Express - trotted out to the mound. "Your arm hurt?" Maddux asked. "Nah," he said. "I'm trying to get those changeups out of the way so I can pitch." As Oswalt relayed the story earlier this week, he cackled like a kid who once fed his broccoli to the family dog. Because he knows full well that this season, his old nemesis has become one of his best friends. Ten years into his career, Oswalt has finally found a changeup grip that works for him. And his sudden utilization of the pitch is one of the big reasons why he enters tonight's start against the Nationals with some of the best numbers of his already-prolific career. "I bet you I've thrown my changeup more this season than I have in 10 years in the majors," Oswalt said earlier this week with a wry grin. For most of his storied career, the veteran righthander has been as meat-and-potatoes as a Mississippi Ponderosa, attacking hitters with his fastball and fooling them with his curve and slider. He had the ability to throw his changeup for a strike. Most times, he could do it without pinching his nose. But it wasn't a weapon. 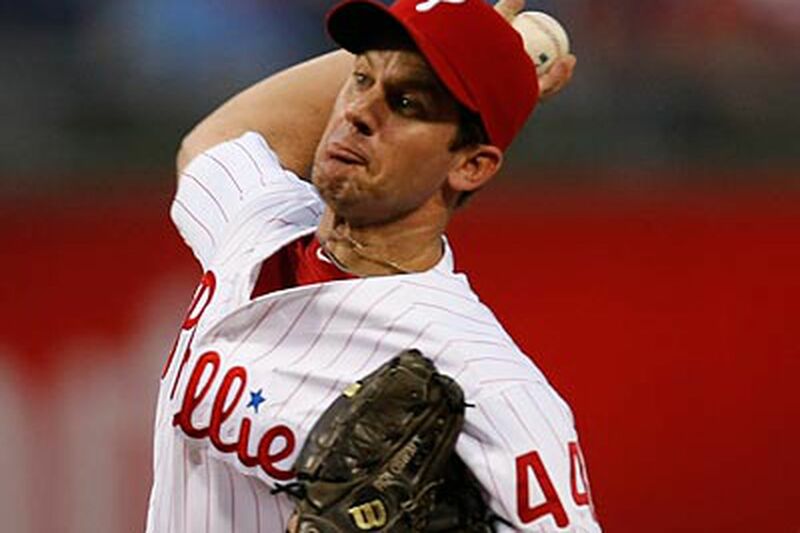 "His changeup back then was, I don't want to say a work in progress, but it was more of a change of pace pitch to show hitters that he had one," said Phillies closer Brad Lidge, who played with Oswalt in Houston from 2002-07. "But his curveball was so deadly back then he almost didn't need to throw the changeup that much." This offseason, Oswalt began experimenting with a new grip on his changeup, switching from a classic circle-change to what is known as a "Vulcan" or "Fosh." The grip looks a lot like how Mr. Spock might throw a changeup, the ball jammed between the middle and index fingers in a sort of live-long-and-prosper configuration. Oswalt took the pitch for a test run this winter at Mississippi Junior College, where he threw live batting practice to his alma mater's team. He continued to work on it during spring training, and by the time the regular season started, he felt like he had added a new pitch to his arsenal. Heading into tonight's start against the Nationals, he is throwing it for about 14 percent of his pitches, which is nearly twice his career average of 7 percent. "It was the grip," Oswalt said. "Different people have different sized hands. That just didn't feel good to me. I tried to get people to explain to me how it should feel coming out of your hand, and how you should pronate your hand. Guys would say, 'Just throw it like a fastball.' But I'd throw it like a fastball at 88. It's just a slow fastball. Guys would be swinging for 95 and run right into it. This is the first year I got it. I changed my grip, and it's allowing me to kill the speed on it." The pitch is an important one. When thrown correctly, its spin mirrors that of a fastball, making it difficult for batters to read it out of the pitcher's hand. Fellow ace Roy Halladay also switched grips on his changeup this season, moving to a split-fingered hold, and has thrown it far more regularly than previous years. Cole Hamels and Ryan Madson, who are known for their changeups, throw a circle-change. "It's a huge pitch for a starter," said Joe Blanton, who describes his grip as a "screwed up" circle-change. "It's something off-speed that looks like a fastball to a hitter. A slider has a certain spin. Your changeup, ideally, has the same action as your fastball." That's the type of action Oswalt has finally found, and it's a big reason why at 32 years old his ERA (2.94) and strikeout rate (8.1-per-nine) are their best since his rookie season in 2001. In his complete-game shutout of the Mets on Sunday, 14 of his 27 outs came on changeups, including all three of David Wright's strikeouts. "If you set it up well," Oswalt said, "you can use it in different situations, big situations." And with 15 games left and a three-game lead in the National League East, the Phillies should have plenty of those coming up. Game 3 of the best-of-five South Atlantic League championship pitting Lakewood against Greenville was postponed due to rain last night. The series, tied 1-1, will resume in Lakewood, N.J., tonight. Tomorrow's Game 4 and, if necessary, Game 5, are both scheduled to be played at Lakewood, starting at 4:05 p.m.